I've posted about the fifth grade teacher before, in December and January. [Gosh, if people didn't know better, they'd think I had a crush on him. Ewwwww, as the third grade girls say.] My issue with him is his personal beliefs. Actually, that's not true. My issue with him is he espouses his personal beliefs. I don't know if he does it in the classroom. But he certainly does it on his car. Do I care if he does it elsewhere? Nope. If I could be 100% assured that he kept his bigoted beliefs to himself, I'd have no issue. In fact, I wouldn't even mind one of my kids being in his classroom. I'd still hate him, but I've hated many people before that I've been nice to. It's called working for a living. You get used to it, swallowing bile on a daily basis. But, you see, I could never be 100% sure. And why is that? Because your beliefs seep into things you do, intentionally and unintentionally. You can't control their intrusion. For example, there is a teacher at the school whom I like immensely. She is great. She is a great teacher. My children like her. We all do. Perhaps even the dog would, if she were introduced to her. 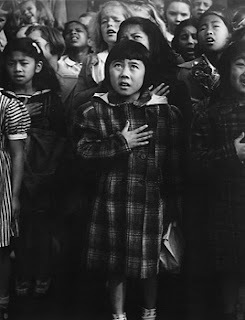 When she was reciting the Pledge of Allegiance recently, I happened to be standing nearby. I could hear her voice clearly. And when it got to the part of "...under God," she didn't say those two words. Of course she wouldn't. And she said, "I knew you'd notice." Because I asked her about it. And I also asked how she hid it from the kids in her class. And she said, "I never let them see my lips." I understand the teacher's reluctance to say the words. I get where this teacher is coming from. It doesn't bother me. It. Doesn't. Bother. Me. But see how a teacher's beliefs seep into the classroom? Even if the lips are hidden. Because maybe someone is watching the teacher's reflection in a window. Or maybe the teacher is loud throughout the entire pledge except at that time. Maybe students notice. They probably don't. But they could. And so, although I understand and respect her decision to not say "under God," it's further proof that there is no way in hell that my kids are going to have that bigot for a fifth grade teacher. I have to write a formal letter requesting placement for the oldest boy. In it, I have to explain why I don't want him taught by BT (Bigot Teacher). No problem. I think I've got the wording down pretty pat in this post.